It is the world's richest football club, whose star player is said to earn an eye-watering £450,000 a week. So when Manchester United's loyal supporters – not to mention parents – were asked to pay a record £110 for the club's new shirt last month, the backlash was unsurprising. Now The Mail on Sunday can reveal that the shirts are made in Cambodian factories by women paid just £31 a week, or 64p an hour. The figure is significantly below the country's living wage called for by local campaigners. The women claim they often endure harsh working conditions and in many cases can afford only slum housing. One worker said her family of four occupied a cramped room – costing £46 a month – in a house shared with three other families. Some complained of being berated by supervisors if they fail to produce at least 60 shirts an hour, occasionally as many as 100. And one woman claimed her eyesight was failing because she spends ten hours a day sewing the shirts' hems. 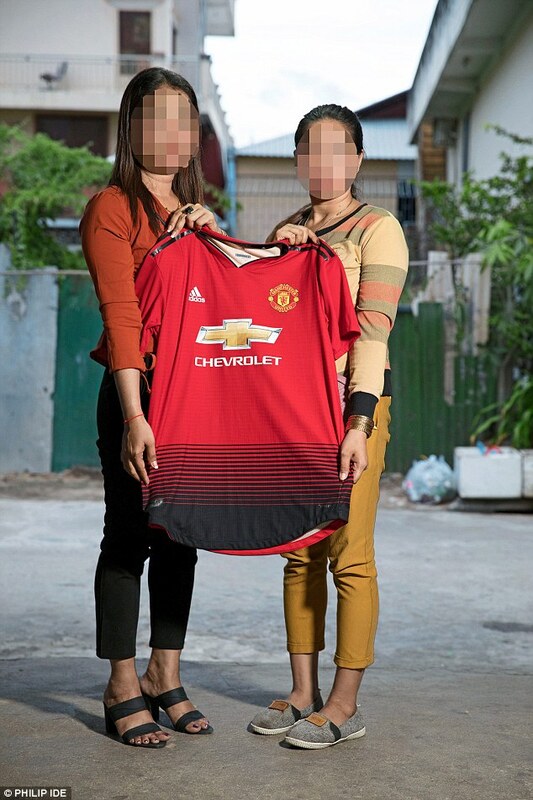 The women's lives are in marked contrast to the gilded existence of United's players, among them Chilean striker Alexis Sanchez, reportedly on £450,000 a week – a sum that would take a Cambodian worker three lifetimes to earn. Adidas pay Manchester United – owned by American billionaires the Glazer family – a world-record £75 million a season to be allowed to make the club's kit. Sales are expected to net the sportswear giant £1.5 billion over ten years. World Cup stars Paul Pogba of France and England's Jesse Lingard were among the players who launched the club's latest strip ahead of the new season, which for United starts on Friday. When told the shirts sell for £110, workers in the Cambodian capital Phnom Penh reacted with disgust and accused the club of profiting from their 'blood and sweat'. The local currency is the riel, but the workers are paid in US dollars. For a six-day week, they receive about $172 (£132) basic pay a month, which is just above the official minimum wage. On top of this they get allowances for food and transport. In total, with overtime, they say they can boost their earnings to a maximum of $250 (£192) a month. The Mail on Sunday talked to workers at the Adidas factory in Phnom Penh, which stands next to a polluted, dusty road strewn with litter. One said: 'The factory is hot and many women faint because they are tired – it happens all the time. Another worker said: 'We have really difficult targets to meet and if we don't meet them we get sworn and shouted at by our supervisor. The factory employs about 1,100 workers, of whom 90 per cent are women. Typically, they start at 7am and finish at 4pm. Many choose to supplement their salary by working until 6pm. A sewing machine operator said: 'The money is so low that sometimes I have to take out loans in order to survive the month. 'But the loans have huge interest – as much as 30 per cent – so that makes it even harder for me the next month.' Local trade unionist Yim Serey Vathanak said: 'These workers are living in poverty and are just about getting by. Adidas defended its treatment of workers, saying the factory meets 20 out of 21 compliance requirements. It said: 'Adherence to fair and safe working conditions and fair wages throughout our supply chain is an integral part of Adidas's business policy and part of the contractual agreements with our suppliers.